U.S. stocks slipped lower on Friday, but this did little to reduce strong gains for the week. Equities rallied as the first quarter earnings season moved into high gear, with investors relieved that banks reduced expenses enough to beat analysts' diminished earnings estimates. The S&P 500 ended the week just off its highest level in four months, while the Dow Jones Industrial Average added over 320 points for its best week since March 18th. In what may likely be among the worst earnings season in seven years, banks stocks - hurt by energy exposure and low interest rates - were expected to disappoint the most. Yet three major banks, while reporting reduced year-over-year results, posted better-than-expected top and bottom line results. For the week, the S&P 500 gained +1.65%, the Dow Industrials advanced +1.82% and the MSCI EAFE (developed international) rallied +3.58%. 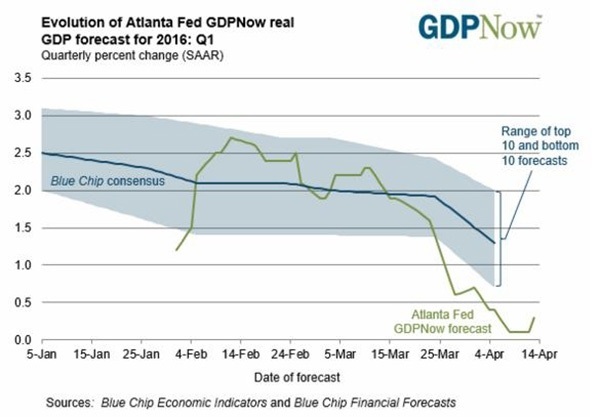 As the chart above shows, prospects for an exceptionally weak first quarter 2016 GDP brightened somewhat over the past week. The Federal Reserve Bank of Atlanta's GDPNow now-casting model forecast for real GDP growth (seasonally-adjusted annual rate) rose for the first quarter to 0.3% on April 13th from 0.1% on April 8. This increase was due to last Wednesday's retail sales report from the U.S. Census Bureau, as the forecast for real consumer spending growth increased from 1.6% to 1.8%. And while that's an improvement, the Commerce Department's initial estimate of first quarter GDP due out on April 28th may still disappoint and may even show a quarter-to-quarter decline in real output. Since the April 13th GDPNow release of the above chart, the consensus forecast among economists has actually declined to 0.7%, according to a Bloomberg survey. Part of the problem, according to JPMorgan, will likely be slower inventory accumulation, as stockpiling falls from $78 billion annualized in 4Q to roughly $50 billion in 1Q. While such an inventory correction would reduce real GDP growth by 0.6% in 1Q, growth in subsequent quarters will depend on the additional adjustments required to return inventories to desired levels. Ultimately, the expected 1Q dip, while unnerving, shouldn't indicate further weakness for the rest of the year, which should help boost risk assets.